As part of human exploration of the Moon, numerous space missions have been undertaken to study Earth's natural satellite. 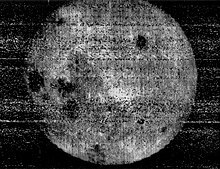 Of the Moon landings; Luna 2 was the first spacecraft to reach its surface successfully, intentionally impacting the Moon on 13 September 1959. In 1966, Luna 9 became the first spacecraft to achieve a controlled soft landing, while Luna 10 became the first mission to enter orbit. Between 1968 and 1972, manned missions to the Moon were conducted by the United States as part of the Apollo program. Apollo 8 was the first manned mission to enter orbit in December 1968, and was followed by Apollo 10 in May 1969. Six missions landed men on the Moon, beginning with Apollo 11 in July 1969, during which Neil Armstrong became the first man to walk on the Moon. Apollo 13 was intended to land, however it was restricted to a flyby due to a malfunction aboard the spacecraft. All nine manned missions returned safely to the Earth. While the United States focused on the manned Apollo program, the Soviet Union conducted unmanned missions that deployed rovers and returned samples to the Earth. Three rover missions were launched, of which two were successful, and eleven sample return flights were attempted with three successes. Missions to the Moon have been conducted by the Soviet Union, United States, European Space Agency, Japan, India, People's Republic of China and Israel. The Moon has also been visited by five spacecraft not dedicated to studying it; four spacecraft have flown past it to gain gravity assistance, and a radio telescope, Explorer 49, was placed into selenocentric orbit in order to use the Moon to block interference from terrestrial radio sources. First attempted launch beyond Earth orbit; failed to orbit due to turbopump gearbox malfunction resulting in first stage explosion. Reached apogee of 16 kilometres (9.9 mi). Failed to orbit; rocket disintegrated due to excessive vibration. Failed to orbit; premature second stage cutoff due to accelerometer failure. Later known as Pioneer 1. Reached apogee of 113,800 kilometres (70,700 mi). Failed to orbit; carrier rocket exploded due to excessive vibration. Failed to orbit; premature second stage cutoff due to erroneous command by ground controllers; third stage failed to ignite due to broken electrical connection. Reached apogee of 1,550 kilometres (960 mi). Failed to orbit; seal failure in hydrogen peroxide pump cooling system resulted in core stage underperformance. Failed to orbit; premature first stage cutoff. Reached apogee of 102,360 kilometres (63,600 mi). Carrier rocket guidance problem resulted in failure to impact Moon, flew past in a heliocentric orbit, later known as Luna 1. Closest approach 5,995 kilometres (3,725 mi) on 4 January. Second stage overperformance resulted in flyby at greater altitude than expected, out of instrument range, with 58,983 kilometres (36,650 mi) of distance. Closest approach at 22:25 UTC on 4 March. First U.S. spacecraft to leave Earth orbit. Failed to orbit; guidance system malfunction. Successful impact at 21:02 on 14 September 1959. First spacecraft to reach lunar surface. Returned first images of the far side of the Moon. Failed to orbit; payload fairing disintegrated due to design fault. Failed to orbit; premature third stage cutoff. Failed to orbit; rocket disintegrated ten seconds after launch. Failed to orbit; second stage oxidiser system malfunction resulting in premature cutoff. Failed to orbit, exploded 68 seconds after launch, at an altitude of 12.2 kilometres (7.6 mi). Second stage ignited while first stage was still attached and burning. Partial launch failure due to guidance problem; attempt to correct using spacecraft's engine resulted in it missing the Moon by 36,793 kilometres (22,862 mi). Failed to deploy solar panels, ran out of power ten hours after launch; incidental impact on the far side of the Moon on 26 April. Solar panels erroneously disengaged from power system, failed ​8 3⁄4 hours after launch when batteries were depleted. Missed the Moon as course correction was not completed. Failed to depart Low Earth orbit; guidance system power failure prevented upper stage ignition. Failed to orbit; guidance failure. Failed to perform mid-course correction, remained in high Earth orbit until given escape velocity by orbital perturbation. Impacted on 2 February 1964, failed to return images due to power system failure. Failed to orbit; third stage underperformed due to oxidiser valve failure. Failed to orbit; power failure caused by broken connection resulted in premature third stage cutoff. Impacted on 30 July 1964 at 13:25:48 UTC. Impacted on 20 February 1965 at 09:57:37 UTC. Upper stage failed to restart due to guidance system short-circuit, Failed to depart low Earth orbit. Impacted on 24 March 1965 at 14:08:20 UTC. Third stage failed to ignite due to loss of oxidiser pressure, failed to orbit. Loss of control after gyroscope malfunction, failed to decelerate for landing and impacted the Moon at 19:10 UTC on 12 May 1965. Engine failed to shut down after performing mid-course correction manoeuvre, flew past the Moon in a heliocentric orbit. Flew past the Moon on 20 July 1965 at a distance of 9,200 kilometres (5,700 mi). Conducted technology demonstration for future planetary missions. Attitude control failure shortly before landing prevented controlled descent; impacted the lunar surface 22:08:24 UTC on 7 October 1965. Landing airbag punctured, resulting in loss of attitude control shortly before planned touchdown, impacted Moon on 6 December 1965 at 21:51:30 UTC. First spacecraft to land successfully on the Moon. Touchdown on 3 February 1966 at 18:45:30 UTC. Returned data until 6 February at 22:55 UTC. Upper stage lost attitude control and failed to ignite; spacecraft never left low Earth orbit. Entered orbit at 18:44 UTC on 3 April 1966, becoming the first spacecraft to orbit the Moon. Continued to return data until 30 May. Landed in Oceanus Procellarum on 2 June 1966 at 06:17:36 UTC. Returned data until loss of power on 13 July. Magnetospheric probe; rocket imparted greater velocity than had been planned, leaving spacecraft unable to enter orbit. Repurposed for Earth orbit mission which was completed successfully. Orbital insertion at around 15:36 UTC on 14 August. Deorbited early due to lack of fuel and to avoid communications interference with the next mission, impacted the Moon at 13:30 UTC on 29 October 1966. Entered orbit on 28 August 1966. Failed to return images; other instruments operated correctly. Conducted gamma ray and X-ray observations to study the composition of the Moon, investigated the lunar gravitational field, the presence of meteorites in the lunar environment and the radiation environment at the Moon. Ceased operations on 1 October 1966 after power was depleted. One thruster failed to ignite during mid-course correction manoeuvre resulting in loss of control. Impacted the Moon at 03:18 UTC on 23 September 1966. Entered orbit on 25 October 1966 and returned data until 19 January 1967. Completed photography mission intended for Luna 11. Entered orbit at about 19:51 UTC on 10 November 1966 to begin photographic mapping mission. Impacted on the far side of the lunar surface following deorbit burn on 11 October 1967 at end of mission. Successfully landed in Oceanus Procellarum at 18:01 UTC on 24 December 1966. Returned images from the surface and studied the lunar soil. Operated until depletion of power at 06:31 UTC on 28 December. Entered orbit at 21:54 UTC on 8 February 1967. Deorbited at end of mission and impacted the Moon on 9 October 1967. Landed at 00:04 UTC on 20 April 1967 and operated until 3 May. Visited by Apollo 12 astronauts in 1969, with some parts removed for return to Earth. Entered orbit at 21:54 UTC on 8 May 1967, operated until 17 July. Decayed from orbit, with lunar impact occurring on 6 October 1967. Contact with spacecraft lost at 02:03 UTC on 17 July, two and a half minutes before scheduled landing. NASA determined that the spacecraft may have exploded, otherwise it impacted the Moon. Magnetospheric probe, studying the Moon and interplanetary space. Deactivated on 27 June 1973. Presumed to have impacted the Moon during the 1970s. Final mission in the Lunar Orbiter series, entered selenocentric orbit on 5 August at 16:48 UTC and conducted a photographic survey until 18 August. Deorbited and impacted the Moon on 31 January 1968. Landed in Mare Tranquillitatis at 00:46:44 UTC on 11 September. Last signals received at 04:30 UTC on 17 December 1967. Technology demonstration for planned manned missions. Failed to reach orbit after a blocked propellant line caused one of the first stage engines to not ignite. Landed in Sinus Medii at 01:01:04 UTC on 10 November. Made brief flight from lunar surface at 10:32 UTC on 17 November, followed by second landing after travelling 2.4 metres (7 ft 10 in). Last contact at 19:14 UTC on 14 December. Technology demonstration for planned manned missions; unable to achieve orbit after second stage engine failed to ignite. Final Surveyor mission. Landed 29 kilometres (18 mi) from Tycho crater at 01:05:36 UTC on 10 January. Operated until 21 February 1968. Failed to orbit after third stage ran out of fuel. Tested communications for proposed manned missions and studied the mass concentration of the Moon. Entered orbit on 10 April at 19:25 UTC. Technology demonstration for planned manned missions. Failed to orbit after second stage engine incorrectly commanded to shut down. Spacecraft was recovered using its prototype launch escape system. Two tortoises and other life forms on board a technology demonstration for planned manned missions. Made a closest approach of 1,850 kilometres (1,150 mi) on 18 September, and circled the Moon before returning to Earth. Landed in the Indian Ocean on 21 September at 16:08 UTC, becoming the first Lunar spacecraft to be recovered successfully and carried the first Earth life to travel to and around the Moon. Technology demonstration for planned manned missions. Flyby occurred on 14 November, with a closest approach of 2,420 kilometres (1,500 mi). Reentered Earth's atmosphere on 17 November; however, recovery was unsuccessful after parachutes were prematurely jettisoned. First manned mission to the Moon; entered orbit around the Moon with four-minute burn beginning at 09:59:52 UTC on 24 December. Completed ten orbits of the Moon before returning to Earth with an engine burn at 06:10:16 UTC on 25 December. Landed in the Pacific Ocean at 15:51 UTC on 27 December. Technology demonstration for planned manned missions. Failed to orbit after one of the four second stage engines shut down prematurely. Third stage engine also shut down prematurely. The spacecraft was recovered using its launch escape system. First launch of the Lunokhod rover. Launch vehicle disintegrated 51 seconds after launch and exploded. First launch of N1 rocket; intended to orbit the Moon and return to Earth. First stage prematurely shut down 70 seconds after launch; launch vehicle crashed 50 kilometres (31 mi) from launch site. Spacecraft landed some 35 kilometres (22 mi) from the launch pad after successfully using its launch escape system. Dress rehearsal for Apollo 11. Lunar Module with two astronauts on board descended to a distance of 14.326 kilometres (8.902 mi) above the lunar surface. Intended to land on the Moon and return lunar soil sample. Did not reach Earth orbit after fourth stage failed to ignite. Intended to orbit the Moon and return to Earth. All first stage engines shut down 10 seconds after launch; launch vehicle crashed and exploded on the launch pad. Spacecraft landed safely 2 kilometres (1.2 mi) from the launch site after using launch escape sequence. Reached lunar orbit at 10:00 UTC on 17 July. Descent retro-rocket burn started at 15:47 UTC on 21 July. Contact lost 3 minutes after de-orbit burn; probably crashed on the Moon. First manned landing on the Moon. The Apollo Lunar Module (LM) Eagle landed at 20:17 UTC on 20 July 1969. Technology demonstration for planned manned missions. Lunar flyby on 10 August, with a closest approach of 1,200 kilometres (750 mi); returned to Earth and landed in Kazakhstan at 18:13 UTC on 14 August. Third attempt at lunar sample return. After reaching low Earth orbit, the fourth stage engine failed to fire for trans-lunar injection due to oxidiser leak. Spacecraft re-entered Earth's atmosphere about 4 days after launch. Fourth attempt at lunar sample return. After reaching low Earth orbit, the fourth stage engine failed to fire for trans-lunar injection due to control system malfunction. Spacecraft re-entered Earth's atmosphere within one orbit after launch. Lunar landing aborted following Service Module oxygen tank explosion enroute to the Moon; flew past the Moon (free-return trajectory) and returned the crew safely to Earth. Technology demonstration for planned manned missions; returned to Earth successfully. Failed during descent to lunar surface. Failed to orbit; intended to orbit the Moon and return to Earth. Sixth and last manned lunar landing. Radio astronomy spacecraft, operated in selenocentric orbit to avoid interference from terrestrial radio sources. Interplanetary spacecraft, mapped lunar north pole to test cameras. Final mission of the Luna programme. Entered orbit on 11 August 1976 and landed in Mare Crisium at 16:36 UTC on 18 August. Sample capsule launched at 05:25 UTC on 19 August and recovered ​96 1⁄2 hours later. Returned 170.1 grams (6.00 oz) of lunar regolith. Five flybys in 1982 and 1983 en route to comet 21P/Giacobini–Zinner. Designed for flyby, placed into selenocentric orbit during extended mission after failure of Hagoromo. Deorbited and impacted in USGS quadrangle LQ27 on 10 April 1993. Deployed from Hiten. Communications failure; entered selenocentric orbit but returned no data. Series of flybys to regulate high Earth orbit. Made two flybys on 1 December 1994 and 27 December 1994 to reach the Earth–Sun L1 Lagrangian point. Completed Lunar objectives successfully; failed following departure from selenocentric orbit. Communications satellite; made two flybys in May and June 1998 en route to geosynchronous orbit after delivery into wrong orbit. Two flybys en route to Mars. Flyby on 30 July 2001 to reach the Earth–Sun L2 Lagrangian point. Impacted moon in USGS quadrangle LQ26 at end of mission on 3 September 2006. Flyby on 15 December 2006 to enter a heliocentric orbit. Made two flybys on 15 December 2006 and 21 January 2007 to enter a heliocentric orbit. THEMIS spacecraft moved to selenocentric orbit for extended mission; entered orbit July 2011. Impacted the Moon in USGS quadrangle LQ30 at end of mission on 10 June 2009. Deployed from Kaguya, decayed and impacted Moon in USGS quadrangle LQ08 on 12 February 2009 after end of mission. Deployed from Kaguya, completed operations on 29 June 2009 but remains in selenocentric orbit. Impacted Moon in USGS quadrangle LQ21 on 1 March 2009, at end of mission. Succeeded through mission, terminated the mission in 2009, remains in selenocentric orbit; discovered water on Moon. Deployed from Chandrayaan-1, impacted Moon in USGS quadrangle LQ30 on 14 November 2008. Observed impact of Centaur upper stage that launched it and LRO, then impacted itself. Impacts in USGS quadrangle LQ30. Following completion of six month Lunar mission, departed selenocentric orbit for Earth–Sun L2 Lagrangian point; subsequently flew by asteroid 4179 Toutatis. Part of the Gravity Recovery and Interior Laboratory, impacted the Moon in USGS quadrangle LQ01 on 17 December 2012 at end of mission. Mission ended on 18 April 2014, when the spacecraft's controllers intentionally crashed LADEE into the far side of the Moon. Entered orbit on 6 December 2013 with landing at 13:12 UTC on 14 December. Deployed from the Chang'e 3 lander, which landed on the Moon. Demonstration of re-entry capsule for Chang'e 5 sample-return mission at lunar return velocity. Attached to third stage of CZ-3C used to launch Chang'e 5-T1. Flyby on 17 May 2018 to designated high Earth orbit. Entered designated Earth–Moon L2 orbit on June 14 in preparation of Chang'e 4 far-side lunar lander in December 2018. Launched on the same rocket as Queqiao and Longjiang-2 but it never entered Moon orbit. Launched on the same rocket as Queqiao and Longjiang-1. Landed 3 January 2019 and deployed the Yutu-2 rover to explore a large basin on the far side of the Moon. First Israeli and first privately funded lunar lander mission. Technology demonstration. Instrumentation included a magnetometer and laser retroreflector. Spacecraft crashed into the lunar surface after main engine failure during descent from lunar orbit phase. There are several future lunar missions scheduled or proposed by various nations or organisations. South Korea KARI Korea Pathfinder Lunar Orbiter (KPLO) December 2020 Falcon 9 Orbiter, technology demonstrator. Russia Roscosmos Luna 25 May 2021 Soyuz-2.1b / Fregat-M Lander will explore natural resources, part of Luna-Glob programme. Russia Roscosmos Luna 26 2022 Soyuz-2 Orbiter, part of Luna-Glob programme. Russia Roscosmos Luna 27 2023 Soyuz Lander, part of Luna-Glob programme. USA NASA EM-2 June 2022 SLS Block 1 Crewed test of the Orion spacecraft on a free-return trajectory around the Moon. USA SpaceX DearMoon 2023 BFR Space tourism and art project; free-return trajectory and Earth re-entry of the BFR Starship. USA NASA EM-3 2024 SLS Block 1B Deliver European System Providing Refuelling, Infrastructure and Telecommunications (ESPRIT), the U.S. Utilization Module, and an airlock to the Lunar Orbital Platform-Gateway (LOP-G). Russia Luna 28, Luna 29, Luna 30, Luna 31 2024-2026 Technology development for prospecting water and other natural resources needed for a future lunar base; part of Luna-Glob program. USA BOLAS TBD Two tethered CubeSats on a very low lunar orbit. USA Constellation program 2020 Cancelled by Obama Administration; efforts routed to the Orion spacecraft. USA, Space Adventures (Private) DSE-Alpha 2018 Mission to transport the first space tourists to fly around the Moon using Soyuz; proposed by Space Adventures (2005). Private (UK) Lunar Mission One 2024 Lander. Cancelled due to tax issues on money obtained from crowdsourcing. USA Resource Prospector 2020s Rover for in-situ resource utilization demonstration, cancelled in 2018, but its scientific instruments will be flown on several future commercial landers, as part of the Commercial Lunar Payload Services. Japan SELENE-2 2020s Orbiter, lander and rover. Cancelled in March 2015. ^ Imaging was primary objective. ^ a b c d e f g h i j k Siddiqi, Asif A. (2002). "1958". Deep Space Chronicle: A Chronology of Deep Space and Planetary Probes 1958–2000 (PDF). Monographs in Aerospace History, No. 24. NASA History Office. pp. 17–19. ^ "Pioneer 0". US National Space Science Data Center. Retrieved 3 December 2013. ^ a b c Wade, Mark. "Luna E-1". Encyclopedia Astronautica. Archived from the original on 22 December 2010. Retrieved 3 December 2013. ^ "Pioneer 1". US National Space Science Data Center. Retrieved 3 December 2013. ^ "Pioneer 2". US National Space Science Data Center. Retrieved 3 December 2013. ^ "Pioneer 3". US National Space Science Data Center. Retrieved 3 December 2013. ^ a b c d Siddiqi, Asif A. (2002). "1959". Deep Space Chronicle: A Chronology of Deep Space and Planetary Probes 1958–2000 (PDF). Monographs in Aerospace History, No. 24. NASA History Office. pp. 21–24. ^ "Luna 1". US National Space Science Data Center. Retrieved 3 December 2013. ^ "Pioneer 4". US National Space Science Data Center. Retrieved 3 December 2013. ^ "Luna 2". US National Space Science Data Center. Retrieved 3 December 2013. ^ "Luna 3". US National Space Science Data Center. Retrieved 3 December 2013. ^ "Pioneer P-3". US National Space Science Data Center. Retrieved 3 December 2013. ^ a b c d Siddiqi, Asif A. (2002). "1960". Deep Space Chronicle: A Chronology of Deep Space and Planetary Probes 1958–2000 (PDF). Monographs in Aerospace History, No. 24. NASA History Office. pp. 25–27. ^ "Pioneer P-30". US National Space Science Data Center. Retrieved 3 December 2013. ^ "Pioneer P-31". US National Space Science Data Center. Retrieved 3 December 2013. ^ a b c Siddiqi, Asif A. (2002). "1962". Deep Space Chronicle: A Chronology of Deep Space and Planetary Probes 1958–2000 (PDF). Monographs in Aerospace History, No. 24. NASA History Office. pp. 34–37. ^ "Ranger 3". US National Space Science Data Center. Retrieved 3 December 2013. ^ "Ranger 4". US National Space Science Data Center. Retrieved 3 December 2013. ^ "Ranger 5". US National Space Science Data Center. Retrieved 3 December 2013. ^ "Sputnik 25". US National Space Science Data Center. Retrieved 3 December 2013. ^ a b c Siddiqi, Asif A. (2002). "1963". Deep Space Chronicle: A Chronology of Deep Space and Planetary Probes 1958–2000 (PDF). Monographs in Aerospace History, No. 24. NASA History Office. pp. 39–40. ^ "Luna 4". US National Space Science Data Center. Retrieved 3 December 2013. ^ a b c Siddiqi, Asif A. (2002). "1964". Deep Space Chronicle: A Chronology of Deep Space and Planetary Probes 1958–2000 (PDF). Monographs in Aerospace History, No. 24. NASA History Office. pp. 41–45. ^ "Ranger 7". US National Space Science Data Center. Retrieved 3 December 2013. ^ a b c d e f g h i Siddiqi, Asif A. (2002). "1965". Deep Space Chronicle: A Chronology of Deep Space and Planetary Probes 1958–2000 (PDF). Monographs in Aerospace History, No. 24. NASA History Office. pp. 47–52. ^ "Ranger 8". US National Space Science Data Center. Retrieved 4 December 2013. ^ "Cosmos 60". US National Space Science Data Center. Retrieved 4 December 2013. ^ "Ranger 9". US National Space Science Data Center. Retrieved 4 December 2013. ^ "Luna 5". US National Space Science Data Center. Retrieved 4 December 2013. ^ "Luna 6". US National Space Science Data Center. Retrieved 4 December 2013. ^ "Zond 3". US National Space Science Data Center. Retrieved 4 December 2013. ^ "Luna 7". US National Space Science Data Center. Retrieved 4 December 2013. ^ "Luna 8". US National Space Science Data Center. Retrieved 4 December 2013. ^ "Luna 9". US National Space Science Data Center. Retrieved 4 December 2013. ^ a b c d e f g h i j Siddiqi, Asif A. (2002). "1966". Deep Space Chronicle: A Chronology of Deep Space and Planetary Probes 1958–2000 (PDF). Monographs in Aerospace History, No. 24. NASA History Office. pp. 47–52. ^ "Cosmos 111". US National Space Science Data Center. Retrieved 4 December 2013. ^ "Luna 10". US National Space Science Data Center. Retrieved 5 December 2013. ^ "Surveyor 1". US National Space Science Data Center. Retrieved 5 December 2013. ^ "Explorer 33". US National Space Science Data Center. Retrieved 5 December 2013. ^ "Lunar Orbiter 1". US National Space Science Data Center. Retrieved 5 December 2013. ^ "Luna 11". US National Space Science Data Center. Retrieved 6 December 2013. ^ "Surveyor 2". US National Space Science Data Center. Retrieved 6 December 2013. ^ "Luna 12". US National Space Science Data Center. Retrieved 6 December 2013. ^ "Lunar Orbiter 2". US National Space Science Data Center. Retrieved 6 December 2013. ^ "Luna 13". US National Space Science Data Center. Retrieved 6 December 2013. ^ "Lunar Orbiter 3". US National Space Science Data Center. Retrieved 17 December 2013. ^ a b c d e f Siddiqi, Asif A. (2002). "1967". Deep Space Chronicle: A Chronology of Deep Space and Planetary Probes 1958–2000 (PDF). Monographs in Aerospace History, No. 24. NASA History Office. pp. 47–52. ^ "Surveyor 3". US National Space Science Data Center. Retrieved 17 December 2013. ^ "Surveyor Lunar Spacecraft". Boeing. Retrieved 17 December 2013. ^ "Lunar Orbiter 4". US National Space Science Data Center. Retrieved 26 May 2014. ^ "Surveyor 4". US National Space Science Data Center. Retrieved 17 December 2013. ^ "Explorer 35". US National Space Science Data Center. Retrieved 26 May 2014. ^ McDowell, Jonathan. "Satellite Catalog". Jonathan's Space Page. Retrieved 26 May 2014. ^ "Lunar Orbiter 5". US National Space Science Data Center. Retrieved 26 May 2014. ^ "Surveyor 5". US National Space Science Data Center. Retrieved 26 May 2014. ^ "Surveyor 6". US National Space Science Data Center. Retrieved 26 May 2014. ^ "Surveyor 7". US National Space Science Data Center. Retrieved 26 May 2014. ^ a b c d Siddiqi, Asif A. (2002). "1968". Deep Space Chronicle: A Chronology of Deep Space and Planetary Probes 1958–2000 (PDF). Monographs in Aerospace History, No. 24. NASA History Office. pp. 69–72. ^ "Luna 14". US National Space Science Data Center. Retrieved 31 May 2014. ^ "Zond 5". US National Space Science Data Center. Retrieved 31 May 2014. ^ "Zond 6". US National Space Science Data Center. Retrieved 31 May 2014. ^ "Apollo 8". National Aeronautics and Space Administration. 8 July 2009. Retrieved 31 May 2014. ^ a b c d e f g h i Siddiqi, Asif A. (2002). "1969". Deep Space Chronicle: A Chronology of Deep Space and Planetary Probes 1958–2000 (PDF). Monographs in Aerospace History, No. 24. NASA History Office. pp. 73–80. ^ "APOLLO 10 (AS-505)". Smithsonian Air and Space Museum. Retrieved 4 April 2019. ^ Siddiqi, Asif A. (2002). "1976". Deep Space Chronicle: A Chronology of Deep Space and Planetary Probes 1958–2000 (PDF). Monographs in Aerospace History, No. 24. NASA History Office. pp. 115–116. ^ "Luna 24". US National Space Science Data Center. Retrieved 14 December 2013. ^ "Hiten". NASA Space Science Data Coordinated Archive (NSSDCA). Retrieved 12 April 2019. ^ "Japanese probe crashes into Moon". BBC. 11 June 2009. Retrieved 8 May 2010. ^ "月周回衛星「かぐや（SELENE）」 – SELENE通信 – お知らせ" (in Japanese). JAXA. 30 June 2009. Retrieved 17 July 2009. ^ "Chandrayaan discovers water on moon". NDTV. 24 September 2009. ^ "China's Moon orbiter Chang'e-2 travels 1.5 km into outer space". The Economic Times. 30 August 2011. Retrieved 31 August 2011. ^ "Chang'e 2: The Full Story". The Planetary Society. 25 August 2012. Retrieved 29 October 2012. ^ a b Gold, Scott (11 September 2011). "After delay, GRAIL moon mission launches". Los Angeles Times. ^ a b Harwood, William. "NASA launches GRAIL lunar probes". CBS News. Retrieved 11 September 2011. ^ a b c d Tariq Malik (10 April 2008). "New NASA Spacecraft to Probe Moon Dust". Space.com. Retrieved 11 November 2008. ^ a b Blau, Patrick. "GRAIL Mission Design and Timeline". Spaceflight 101. Archived from the original on 19 July 2012. Retrieved 29 October 2012. ^ "Trajectory Design Enhancements to Mitigate Risk for the Transiting Exoplanet Survey Satellite (TESS)" (PDF). 13 September 2016. Retrieved 1 January 2017. ^ How China's lunar relay satellite arrived in its final orbit. Luyuan Xu, The Planetary Society. June 15, 2018. ^ Rincon, Paul (2018-12-07). "China mission launches to far side of Moon". BBC News. Retrieved 2018-12-09. ^ Grush, Loren (21 February 2019). "Watch SpaceX launch a trio of spacecraft, including a lander bound for the Moon". The Verge. Retrieved 22 February 2019. ^ "Beresheet". NASA Solar System Exploration. 19 February 2019. Retrieved 4 April 2019. .
^ Pietrobon, Steven. "New Zealand Launch Record (2009 to present)". Retrieved 11 July 2018. ^ Clark, Stephen (20 November 2017). "NASA expects first Space Launch System flight to slip into 2020". Spaceflight Now. Retrieved 24 May 2018. ^ Astrobotic Ready to Become Delivery Service to the Moon. Michael Coli, Spaceflight Insider. 19 March 2018. ^ "China Plans 2017 Lunar Sample-Return Mission". Aviationweek. 16 December 2013. ^ Knapton, Sarah (19 March 2017). "European rocket scientists pledge to make first private Moon landing in 2018". The Daily Telegraph. Retrieved 11 July 2018. ^ "PTScientists 'Mission to the Moon' to take care not to harm Apollo 17 landing site | collectSPACE". collectSPACE.com. Retrieved 2017-12-09. ^ Kim, Jack (20 November 2007). "South Korea eyes moon orbiter in 2020, landing 2025". Reuters. Retrieved 9 November 2008. ^ SpaceX selected to assist 2020 South Korean lunar orbiter voyage. Lee Keun-young, Hankyoreh. 30 December 2017. ^ "小型探査機による高精度月面着陸の技術実証（SLIM）について" (PDF) (in Japanese). 3 June 2015. Retrieved 23 June 2015. ^ "Small lunar-lander "SLIM" for the pinpoint landing technology demonstration" (PDF). 2015. Retrieved 23 June 2015. ^ "The tiny rover payload in SLIM mission" (PDF). 2015. Retrieved 23 June 2015. ^ a b Pietrobon, Steven (11 July 2018). "Russian Launch Manifest". Retrieved 11 July 2018. ^ Russian Moon exploration program. Russian Research Institute (IKI). 2017. ^ Toyota, Hiroyuki; Nishiyama, Kazutaka; Kawakatsu, Yasuhiro (15 August 2017). "DESTINY+: Deep Space Exploration Technology Demonstrator and Explorer to Asteroid 3200 Phaethon" (PDF). Low-Cost Planetary Missions Conference. Retrieved 2017-09-21. ^ Mitrofanov, Igor. "Luna-Glob" and "Luna-Resurs": science goals, payload and status (PDF). EGU General Assembly 2014. ^ Gebhardt, Chris (22 September 2017). "SLS EM-1 & -2 launch dates realign; EM-3 gains notional mission outline". NASASpaceFlight.com. Retrieved 23 September 2017. ^ "#dearMoon". #dearMoon. Retrieved 2018-09-18. ^ Sloss, Philip (11 September 2018). "NASA updates Lunar Gateway plans". NASASpaceFlight.com. Retrieved 17 September 2018. ^ "Russia may select first crew for its Federation spacecraft next year". SpaceFlight Insider. 1 November 2017. ^ TeamIndus plans lunar probe launch in 2019, expanding India's private space ecosystem. Immanuel Jotham, International Business Times. 8 April 2018. ^ Intuitive Machines headed to the moon in 2021. Yahoo Finance. 29 November 2018. ^ Nova-C lunar lander. Intuitive Machines. Accessed on 1 December 2018. ^ a b China's Deep Space Exploration Roadmap. 2018. ^ NASA Wants to Put a Rover on the Moon by 2023. Meghan Bartels, Space.com. 20 March 2019. ^ Lele, Ajey (2013). Asian Space Race: Rhetoric Or Reality. Springer. pp. 70–72. ISBN 978-81-322-0732-0. North Korea has also announced its intentions to undertake manned and Moon missions in the future. Nonetheless, the current status of their space programme indicates that they would have to overcome many hurdles to reach that level of technology sophistication. ^ Talmadge, Eric (4 August 2016). "AP Exclusive: North Korea hopes to plant flag on the moon". The Big Story. Associated Press. Retrieved 9 August 2016. ^ "ILN". NASA. Archived from the original on 27 May 2010. Retrieved 11 November 2008. ^ Bi-Sat Observations of the Lunar Atmosphere Above Swirls (BOLAS): Tethered SmallSat Investigation of Hydration and Space Weathering Processes at the Moon. (PDF) Stubbs, T. J.; Malphrus, B. K.; Hoyt, R., etal. 49th Lunar and Planetary Science Conference; 19–23 March 2018 at The Woodlands, Texa, USA. ^ a b The vision of the Russian Space Agency on the robotic settlements in the Moon. Maxim Litvak, IKI/Roscosmos. 2016. ^ a b Dominic Basulto (30 April 2015). "Why it matters that Japan is going to the moon". Washington Post. Retrieved 3 March 2015. ^ Toyota to build lunar rover as Japan tries to land astronaut on moon. Sky News. 6 March 2019. ^ "Moon may light man's future". China Daily. 15 August 2009. ^ "China has no timetable for manned moon landing: chief scientist". Xin Hua News. 19 September 2012. ^ "Japan's Moon mission in jeopardy". Canadian Broadcasting Corporation. 15 January 2007. Retrieved 9 November 2008. "Luna-Glob". Gunter's Space Page. 6 November 2008. Retrieved 11 November 2008. ^ "Just watch. Don't Touch. Moon Mission busted" (in German). n-tv. 12 July 2008. Archived from the original on 6 November 2008. Retrieved 9 November 2008. ^ Craig Brown (11 January 2007). "British scientists shoot for the moon". Edinburgh: The Scotsman. Retrieved 24 November 2007. ^ Pallab Ghosh (10 January 2007). "Britain plans first Moon mission". BBC. Retrieved 9 November 2008. ^ NASA's 2011 Budget Should Allow Flexibility Despite Cuts, Space.com, 15 April 2011. ^ Bérengère Houdou; James Carpenter (30 October 2008). "The MoonNEXT Mission" (PDF). LEAG – ILEWG – SRR. ESA/ESTEC, The Netherlands. Retrieved 17 March 2011. ^ "Fly us to the Moon…south pole to be precise". ESA news. 31 March 2010. Retrieved 17 March 2011. ^ "Is Space Adventures Sending Customers Around the Moon?". ^ Whittington, Mark (29 January 2011). "Space Adventures Closer to Private 'Round the Moon Voyage". Yahoo! News. Retrieved 29 March 2011. ^ "Lunar Mission Details". Space Adventures. Retrieved 29 March 2011. ^ Parnell, Brid-Aine. "Non-profit Moon Mission Falls Foul Of The Crowdfunding Tax Conundrum". Forbes. Retrieved 2019-01-27. ^ "UK 'to lead moon landing' funded by public contributions". BBC News. 19 November 2014. ^ "Lunar Mission One: A New Lunar Mission for Everyone". British Interplanetary Society. 19 November 2014. Retrieved 2 March 2015. ^ A brief history of Resource Prospector, NASA's cancelled lunar mission. Jason Davies, The Planetary Society. 3 May 2018. ^ NASA emphasizes commercial lunar lander plans with Resource Prospector cancellation. Jeff Foust, Space News. 28 April 2018. ^ Mission Concepts of Unprecedented Zipangu Underworld of the Moon Exploration (UZUME) Project. (PDF). Junichi HARUYAMA, Isao KAWANO, Takashi KUBOTA, etal. J-Stage. 3 July 2015. Accessed: 24 September 2018. Quote: "SELENE-2 was a mission with an intension to send a landing module to the Moon, and a lunar hole was a candidate for the landing site. However, the SELENE-2 mission was officially terminated in March 2015."